This year we decided to invite friends over for a cookie party one Saturday afternoon. I placed the calls. (No time to send invitations --- that's not how we roll...) I desperately searched for children's aprons. Oh, yes, I planned to doll everyone up with personalized aprons and baker's boxes to take goodies home from the exchange plus the yummy treats the children would deck out in their frosting finest. And I tried to do it all in four days. Then I realized you can't decide to have a party, plan a party, clean for the party, buy for the party, and have the party all in four days when you are looking at the likes of 16 children gracing the halls of your humble abode plus their moms (and perhaps a stray dad or two...I know my husband was planning to be 'busy' that day...). Instead, we canceled - or postponed, as it were - and, rather, each child old enough to talk was given their own party and invited their own friends over for their own special day. 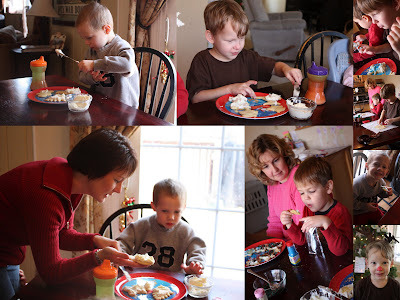 T invited his friends over on a 'late start' day of school - when moms dropped them off, the boys stayed outside to play, then came in to make cinnamon ornaments, spread some frosting on prebaked cookies, and head off to school, fully loaded on sugar and fun. 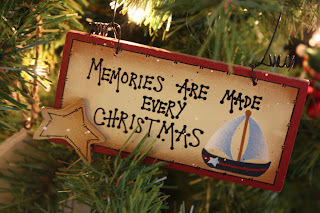 Two days later, when the ornaments were dried, T delivered them to his friends' homes, complete with Santa hat adorning his red head. Meiners and I invited our friends over for a relaxed Friday lunch and playtime. The boys ate the sack lunches their moms brought for them. I rolled cookie dough onto individual sheets of parchment paper for each boy the night before, and after their lunch, the boys chose their cookie cutters and went to town. 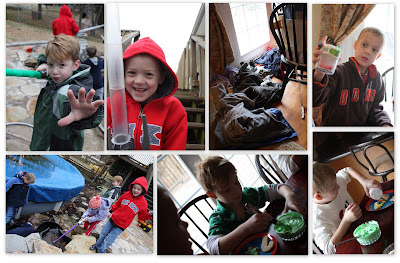 While they played in the playroom, the cookies baked, and the moms enjoyed lunch of homemade soup and salad. Then the frosting came out, and the fun ended with sweet smiles on their little boy faces. Pookie's party was last (but not least!). She chose her party on an 'early release' day of school. Her friends were greeted with individual stations of dough and oodles of cookie cutter choices. 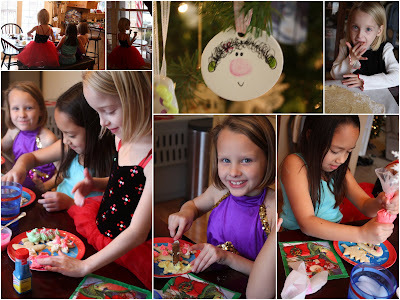 They played dress up while the cookies baked, then tried their hands at real decorating tools, making rosettes and outlining their snowflakes before sprinkling colored sugars and sprinkles onto their creations. Before they left, we nabbed a print of their thumb to make unique ornaments. We'll be delivering those this weekend. I hope all the children enjoyed themselves! We certainly loved having them join us in our cookie fun!